Oren Alfred "Al" Krause was born October 23, 1890, in Fond du Lac Co., WI, and died August 23, 1955, at his home, City of Bradford, McKean Co., PA, at age 64. Buried in Willow Dale Cemetery, 30 Hedgehog Lane, Bradford, McKean Co., PA. He is the son of August Ferdinand Krause of Swanbach, Prussia, Germany, and Mary Jane Abbey of Clarke Twp., Durham Co., Canada West. Alfred was a WWI Veteran. Corporal, U.S. Army, Co. F, 3rd Pioneer Inf., 7/22/1918 - 8/13/1919. 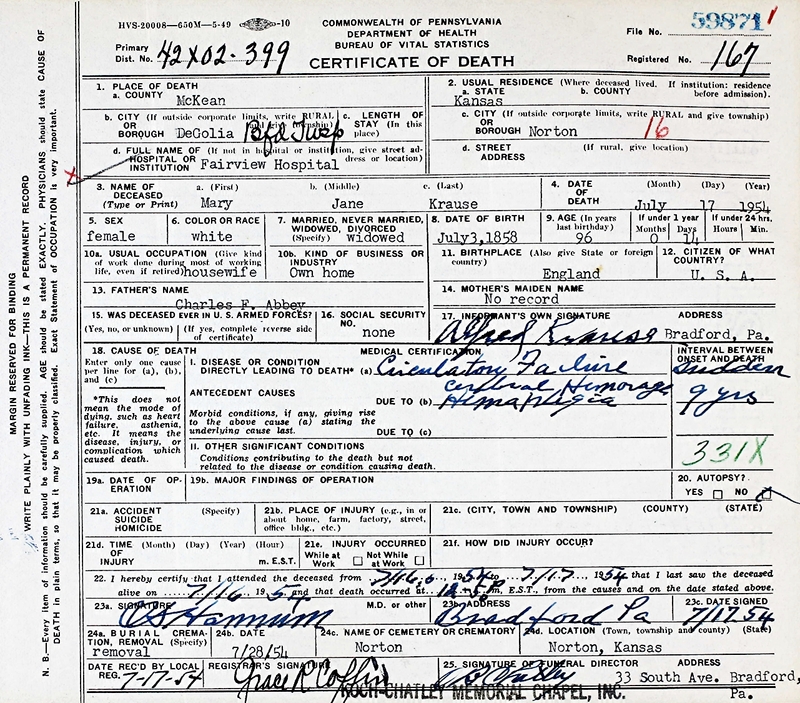 Hazelle Blanche Potter was born March 30, 1893, in Cedar Rapids, Linn Co., IA, and died February 23, 1968, at Bradford Hospital, Bradford, McKean Co., PA, at age 74. Buried in Willow Dale Cemetery, 30 Hedgehog Lane, Bradford, McKean Co., PA. She is the daughter of Franklin Lincoln "Frank" Potter of Beaver Twp., Iroquois Co., IL, and Myrtle Louise "Mae" Duncan of Brooklyn, Poweshiek Co., IA. Frank Lincoln Potter was born April 19, 1863, near Watseka, Iroquois Co., IL, and died May 29, 1909, in Minneapolis, Hennepin Co., MN (age 46). 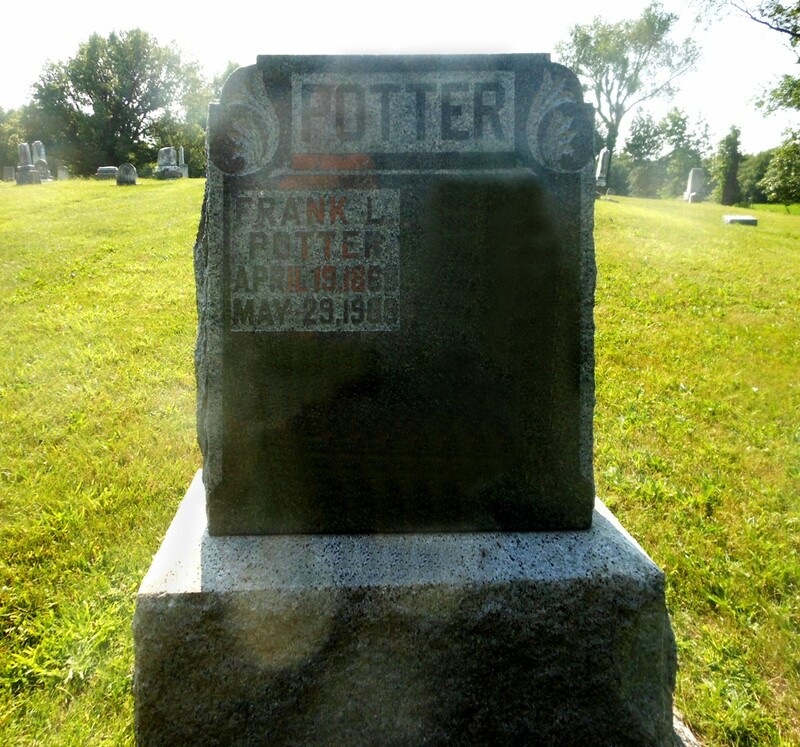 Frank L. Potter is buried in Belmont Cemetery, Belmont Twp., Iroquois Co., IL. His father is Clark Potter of Vermont, and Unknown of Vermont. Myrtle Louise Duncan was born September 5, 1870, in Brooklyn, Poweshiek Co., IA, and died January 2, 1965, at Emery Nursing Home, Bradford, McKean Co., PA, at age 94. Buried in Willow Dale Cemetery, 30 Hedgehog Lane, Bradford, McKean Co., PA. Her parents are Andrew Duncan (born October 5, 1842, in Clark, OH; died November 26, 1912, in Minneapolis, Hennepin Co., MN), and Elizabeth Frizzell (born December, 1841, in Ohio; died November 29, 1928, in Minneapolis, Hennepin Co., MN). Oren Alfred Krause and Hazelle Blanche Potter were married about 1941 in Unknown. Oren Alfred Krause and Hazelle Blanche (Potter) Krause had no children. 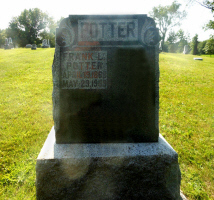 Franklin Lincoln "Frank" Potter is buried in Belmont Cemetery, Belmont Twp., Iroquois Co., IL. Thanks to Find-A-Grave for making this image available. 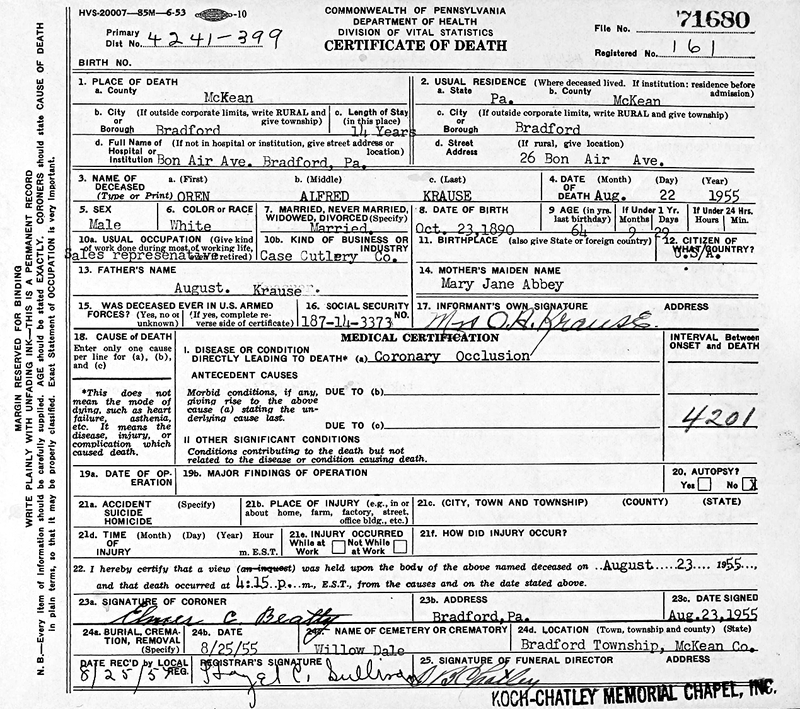 Oren Alfred "Al" Krause was born October 23, 1890, in Fond du Lac Co., WI. Hazelle Blanche Potter was born March 30, 1893, in Cedar Rapids, Linn Co., IA. 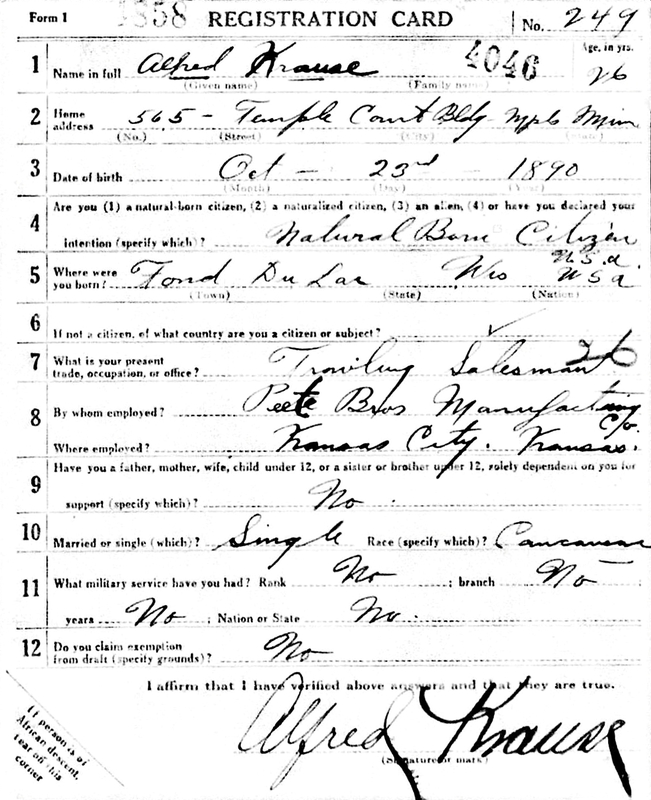 The 1895 Iowa State Census taken on March 1, 1895, shows F. L. Porter (age 33) born in Illinois, is a married Protest Fireman, and is living in Cedar Rapids, Linn Co., IA. Living with him are: his wife, N. L. Potter (age 25) born in Poweshiek Co., IA; a male, Ralph Potter (age 4) born in Benton Co., IA; and a female, Hazel Potter (age 2) born in Benton Co., IA. 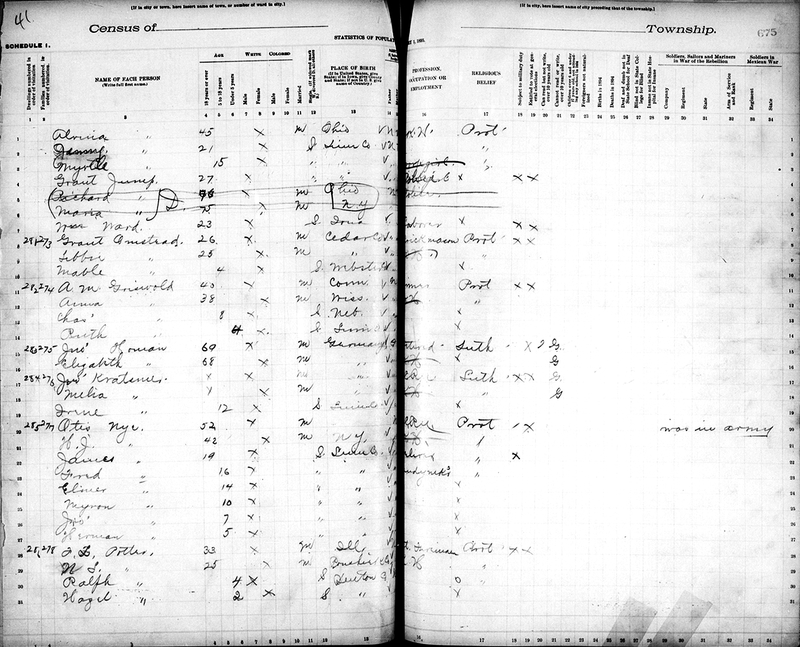 The 1895 Iowa State Census for Cedar Rapids, Linn Co., IA. Following the death of Alfred's father, his mother Mary Jane (Abbey) Krause came to Bradford and lived with him and Hazelle. They resided at 26 Bon Air Avenue. Alfred's sister, Effie Krause, married John Russell Case. Russ was the founder of the W. R. Case and Sons Cutlery Company in Bradford. Erma Belle Potter was born October 2, 1898, in Cedar Rapids, Linn Co., IA. She died August 10, 1962, at Bradford Hospital, Bradford, McKean Co., PA (age 63). Buried in Willow Dale Cemetery, 30 Hedgehog Lane, Bradford, McKean Co., PA. Born in Grinnell, Poweshiek Co., IA. Erma married March 13, 1920, in Minneapolis, Hennepin Co., MN, to Alexander Noble Presho: Born July 17, 1891, in Quebec, Capitale-Nationale Region, Quebec, Canada; Died August 21, 1957, in Canada (age 66). Buried in Cimetière Mont-Royal, Outremont, Montreal Region, Quebec, Canada. He was a car salesman living in Minneapolis, MN, in 1917. Erma Belle Potter Delayed Birth Record shows the full names of her parents. 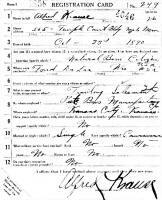 The 1900 U. S. Census taken on June 5, 1900, shows F. L. Potter (age 39) born April, 1861, in Illinois to Vermont-born parents, is a married Stationary Engineer and who is renting his home, and is living at 408 12th Street, 6th Ward, Lee Twp., City of Des Moines, Polk Co., IA. Living with him are: his wife of 10 years, Mertie L. Potter (age 29) born September, 1870, in Ohio to Ohio-born parents, with all 4 of the children born to her still alive; his son, Ralph Potter (age 9) born February, 1891, in Iowa to Illinois and Ohio-born parents; his daughter, Hazzle Potter (age 7) born March, 1893, in Iowa to Illinois and Ohio-born parents; his daughter, Gladys Potter (age 4) born November, 1895, in Iowa to Illinois and Ohio-born parents; and his daughter, Erma B. Potter (age 7/12) born October, 1899, in Iowa to Illinois and Ohio-born parents. The 1905 Kansas State Census dated March 1, 1905, shows August Krause (age 49) born in Germany and having moved from Wisconsin is a married Farmer owning his own farm and living in Aldine Twp., Norton Co., KS. Living with him are: Oscar Krause (age 16) born in Kansas; Alfred Krause (age 14) born in Wisconsin; Wallace Krause (age 12) born in Kansas; Jason Krause (age 10) born in Kansas; Mary J. Krause (age 45) born in Canada and having moved from Wisconsin; Elda Krause (age 21) born in Kansas; Belle Krause (age 19) born in Kansas; Nellie Krause (age 9) born in Kansas; and Lucille Krause (age 6) born in Kansas. Franklin Lincoln "Frank" Potter died May 29, 1909, in Minneapolis, Hennepin Co., MN, at age 46. Buried in Belmont Cemetery, Belmont Twp., Iroquois Co., IL. 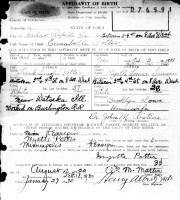 The 1910 U. S. Census taken on April 16, 1910, shows Mytie L. Potter (age 39) born in Iowa to Ohio-born parents, is a widowed Head of Household, and with all 4 of the children born to her still alive, and who is renting her home, and is living 2419 4th Avenue South, 8th Ward, City of Minneapolis, Hennepin Co., MN. Living with her are: her unmarried son, Ralph Potter (age 19) born in Iowa to Illinois and Iowa-born parents, a Baker at a Bakery; her unmarried daughter, Hazel Potter (age 17) born in Iowa to Illinois and Iowa-born parents, a Hair Dresser at a Department Store; her unmarried daughter, Gladys Potter (age 14) born in Iowa to Illinois and Iowa-born parents; and her unmarried daughter, Erma Potter (age 11) born in Iowa to Illinois and Iowa-born parents. The 1910 U. S. Census taken on May 9, 1910, shows August Krause (age 54) born in Germany to German parents and having been married 30 years is a farmer owning his farm. He is living in Aldine Twp., Norton Co., KS. Living with him is his wife Mary J. Krause (age 50) born in Canada to Canadian and English parents, and 7 of her 11 children still living. Also living there are Alfred O. Krause (age 19) born in Wisconsin; and Wallace Krause (age 17) born in Kansas. Alfred Krause, who has been working for the S. & S. Stock Exchange at Kansas City, Missouri for the past two years is now employed by the Peet Brothers Manufacturing Co., and is on the road in Minnesota and goes from there to Wisconsin. 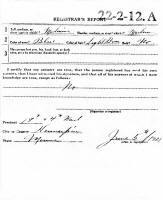 The WWI Draft Registration Report taken on June 5, 1917, shows Alfred Krause (age 26) born October 23, 1890, in Fond du Lac, WI, is an unmarried Traveling Salesman for Peete Bros. Manufacturing Co. of Kansas City, KS. He is living at 565 Temple Court Building, Minneapolis, MN. Medium height, medium build, blue eyes and light brown hair. 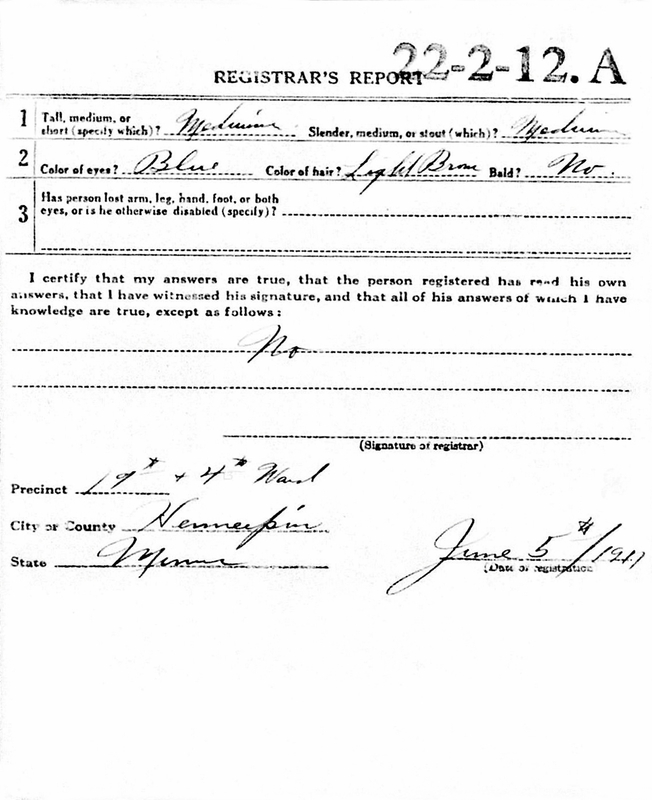 The WWI Draft Registration Report for Oren Alfred Krause. A very early photo of the Peet Bros. Manufacturing Company, Kansas City, MO. 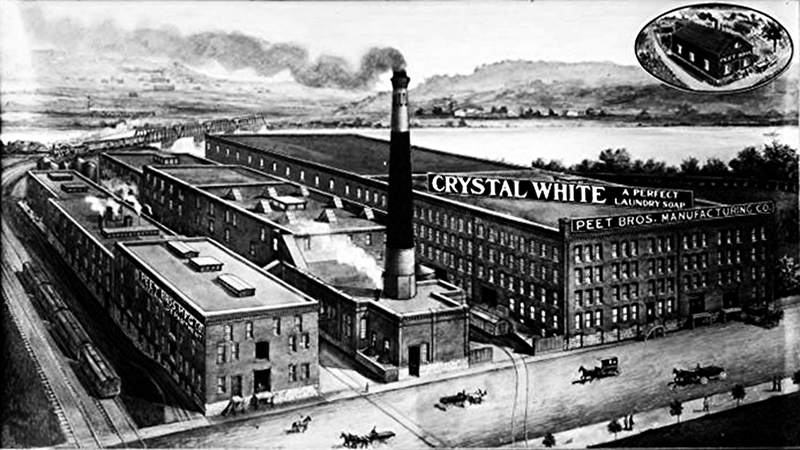 A 1898 drawing of the Peet Bros. Manufacturing Company, Kansas City, MO. A 1918 drawing of the Peet Bros. Manufacturing Company, Kansas City, MO. A 1918 advertisement poster from the Peet Bros. Manufacturing Company, Kansas City, MO. As a U. S. Army soldier, Oren Alfred Krause served in WWI as a Corporal in Co. F, 3rd Pioneer Infantry, from July 22, 1918, to August 13, 1919. Mr. Aug. Krause received letters from his sons, Jason and Alfred. They are on the Verdun front, well and all right, and are hoping to be home by March. Alfred Krause has been discharged from the service and is visiting home for a week. He will return to Minneapolis, Minnesota where he was employed before entering the service. 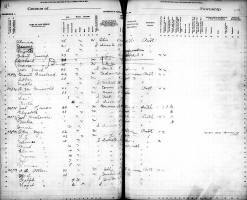 The 1920 U. S. Census taken on January 14, 1920, shows Myrtle Potter (age 48) born in Iowa to Ohio-born parents, is a widowed Head of Household, and is renting her home, and is living 1816 Stevens Avenue, 5th Ward, City of Minneapolis, Hennepin Co., MN. Living with her are: her unmarried daughter, Hazel Potter (age 25) born in Iowa to Illinois and Iowa-born parents, a Hairdresser at a Hair Shop; and her unmarried daughter, Erma Potter (age 21) born in Iowa to Illinois and Iowa-born parents, a Supervisor at a Telephone Exchange. The 1920 Minneapolis, MN, City Directory shown Alfred Krause is a Travelling Agent for Peet Bros. Co., and is rooming at the Hotel Andrews. The 1924 Minneapolis, MN, City Directory shows Potter, Hazelle B. is a Hairdresser, and is residing at the Hotel Hastings, 1030 Nicollet Avenue. The 1925 Minneapolis, MN, City Directory shows Alfred Krause is a Salesman for Peet Bros. Co., and is residing at the Hotel Hastings. 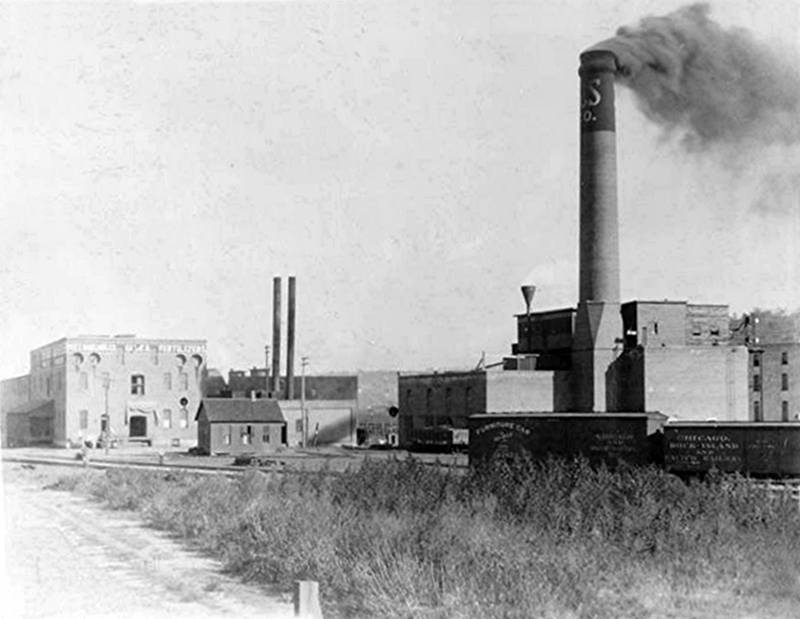 Manufacturing Plant pre Merger with Colgate and Palmolive Peet Brothers was a Kansas based soap manufacturer that was founded in 1872. 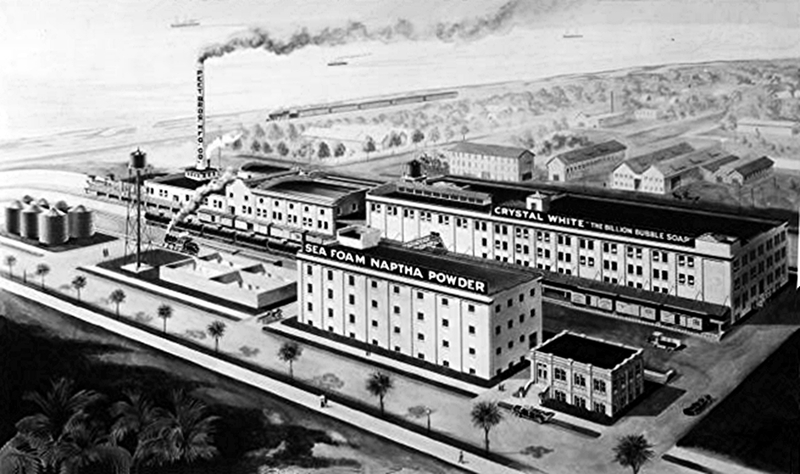 Their products included Crystal White Laundry Soap, Crystal White Soap Flakes, Creme Oil Toilet Soap, Imperial Peroxide Toilet Soap, Sea Foam Naphtha Washing Powder, Borax Washing Compound, and many others. The company's main plant was located in Kansas City. In 1864, Caleb Johnson founded a soap company called B. J. Johnson Soap Co., in Milwaukee. In 1898, this company introduced a soap made of palm and olive oils, called Palmolive. It was so successful that that the B. J. Johnson Soap Co. changed their name to Palmolive in 1917. 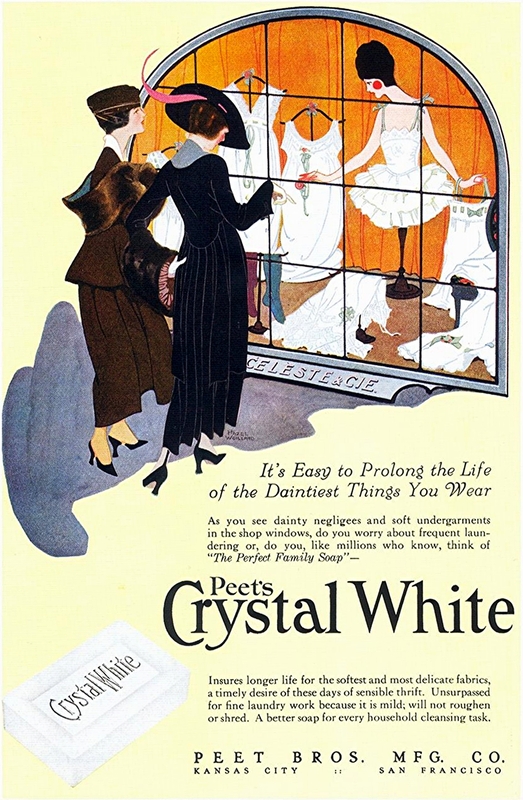 In 1927, Palmolive merged with Peet Brothers to became Palmolive Peet. In 1928, Palmolive - Peet joined the Colgate Company to create the Colgate -Palmolive - Peet Company. In 1953, the company's name was simplified to Colgate-Palmolive. 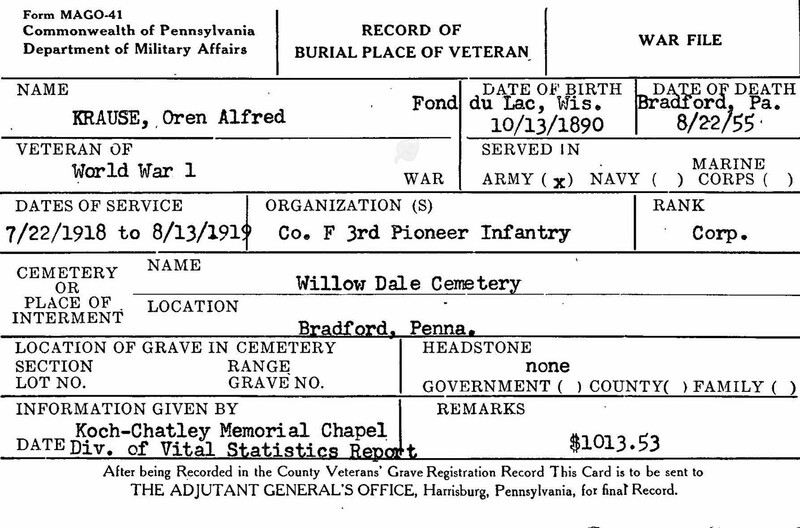 About 1926, Oren Alfred Krause began working for his brother-in-law's company, W. R. Case & Son, of Bradford, McKean Co., PA. Oren Alfred Krause's sister, Effie L. (Krause) Case, died August 8, 1929, in Bradford, McKean Co., PA, at age 48. Oren was hired as a Travelling Salesman, and appears to have lived out of hotel rooms for a number of years, without renting or owning a home. This type of life appears to have changed following his marriage about 1942 to Hazelle B. Potter. He worked for the company the rest of his life, and rose to the position of Vice President. The 1927 Minneapolis, MN, City Directory shown Oren A. Krause is a Travelling Salesman, and is residing at the Hotel Hastings. Elizabeth (Frizzell) Duncan died November 29, 1928, in Minneapolis, Hennepin Co., MN, at age 86. Buried in Lakewood Cemetery. Funeral services will be held at 2 p.m. Friday at the Burd Johnson undertaking parlor, 2301 Dupont avenue S., for Mrs. Elizabeth Duncan, who died Monday at her home, 2436 First avenue S. She is survived by two daughters, Mrs. Myrtle Potter and Mrs. Harriet Olney, both of Minneapolis. Burial will be in Lakewood cemetery. In August, 1929, Alfred Krause was living in Minneapolis, Hennepin Co., MN. After a sickness of almost six months' duration, Mrs. J. Russell Case, prominent cutlery manufacturer of this city, died last evening at 8:15 o'clock at her home, 723 East Main street. he had been a patient in several hospitals during her sickness and was brought back to Bradford from Buffalo just a few days ago. Mrs. Case was born in Norton county, Kas., March 18, 1881, and had come to Bradford some 30 years ago. She was married to Russell Case in 1898. She was a member of the Eastern Star. Surviving are her husband J, Russell Case; her parents, Mr. and Mrs. August Krause of Norton, Kansas; two sisters, Mrs. Elda Darling and Mrs. Dell McCray, both of Godding, Idaho; foru brothers, Oscar Krause of Godding, Idaho, Alfred Krause of Minneapolis, Minn., Jason Krause of Wichita, Kansas, Wallace Krause of Sioux City, Nebraska. Two nieces of Godding also survive. Funeral services will be held Monday afternoon at 2 o'clock from the home under the direction of Undertaker McAllister. The funeral of Mrs. J. Russell Case was held yesterday afternoon at 2 o'clock at the home in East Main street. Rev. R. J. Mooney, pastor of the Universalist church, was in charge of the services, which were largely attended. The pallbearers were Alfred Krause, Oscar Krause, Howard Williams, Guy Rhodes, Harvey Stroup and Harold Osborne. The remains were taken to Little Valley, N. Y., for interment in the family plot. Those from away in attendance at the obsequies were: Mrs. August Krause of Norton, Kan., mother of the deceased; Alfred Krause of Minneapolis, Minn.; Oscar Krause of Gooding, Idaho, brothers; Mrs. Walter Darling of Gooding, Idaho, a sister; Miss Mary Darling of Gooding, a niece; Mrs. Elizabeth Milks, Little Valley, N. Y.; Mrs. Susan Johnson, Salamanca, N. Y.; Mrs. James Ryan, Tulsa, Okla.; Mrs. Gertrude Herrington, Tulsa, Okla.; Mr. and Mrs. Henry Card, Fredonia, N. Y.; Mr. and Mrs. William Lutz, Buffalo, N. Y.; Mr. and Mrs. Tint Champlin, Little Valley, N. Y.; Mr. and Mrs. Dean Case, Little Valley, N. Y.; Mrs. Sarah Case, Little Valley, N. Y.; Mrs. Irwin Prenatt, Meadville; Mrs. Eva Brown, Little Valley, N. Y.; Mr. and Mrs. Emerson Brown, Olean, N. Y.; Mr. and Mrs. Frank Hout, Olean, N. Y.; Mr. and Mrs. Sam Fx, Little Valley, N. Y. and M. L. Champlin of Lilly Dale. The 1930 U. S. Census taken on April 16, 1930, shows Hazette B. Potter (age 36) born in Iowa to Illinois and Iowa-born parents, is an unmarried Roomer, and is renting her home for $55/month, and is living 3305 South Fremont Avenue, 8th Ward, City of Minneapolis, Hennepin Co., MN. No. 27 Oren A. Krause vs. Equitable Life Assurance Society of the U. S., Assumpsit. The assumpsit action of Oran A. Krause, plaintiff, vs. Equitable Life Assurance Society of the United States; was completed when the jury returned a verdict awarding the plaintiff the sum of $2,074.26. The case was completed with 11 jurors, by agreement of attorneys for both sides, when Mrs. Fannie Gleason, of Smethport, one of the members of the jury hearing the case, was taken ill.
Alfred Krause was living in Pennsylvania when his sister, Belle Etta (Krause) McCrea, died December 11, 1935, in Boise, Ada Co., ID, at age 50. Pittsburgh, Dec. 15. - Oren A. Krause, Bradford, lost his suit against the Equitable Life Assurance company of the United States when a federal jury returned a verdict in favor of the defendant today. Krause alleged the insurance company owed him $105.24 per month for the period from August 1933 to April 1936, plus the accrued interest, claiming illness during that time totally disabled him. He based his suit upon an insurance policy, issued October 15, 1925, which stated that if a person were totally disabled before reaching the age of 65, the monthly premium of $105.24 would be paid. The insurance company contended Krause was not completely disabled. PITTSBURGH - A federal jury returned a verdict for the Equitable Life Assurance Society in a suit by Oren A. Krause, of Bradford, for $3,472 he claimed due as disability benefits. A New England animal trainer, en route home from a fair in Texas, was held yesterday after a morals court hearing at which it was testified she took $90 from a Bradford, Pa., man whom she met casually in a downtown hotel. City Detective Louis Foster arrested blond Margo Kalin, 32, of Bridgeport, Conn., in a McKees Rocks saloon a short time after O. A. Krause complained that he was missing $90 soon after he and the girl parted in a downtown hotel. Miss Kalin denied the charge. Held over at a previous hearing, Miss Margo Calin, 32, a New England animal trainer, was held for court yesterday on a larceny charge by Magistrate A. D. Brandon in morals court, accused of stealing $90 from O. A. Krause of Bradford, Pa. Krause complained that he missed the money after he left the company of the woman in a downtown hotel. Miss Kalin was passing through Pittsburgh on her way home from a fair in Texas. PITTSBURGH, March 11. (AP) - Margo Kalin, 32, of Bridgeport, Conn., trainer of performing dogs, was held for court today by Magistrate A. D. Brandon on a charge of larceny. O. A. Krauss of Bradford, Pa. Krause told police he missed $90 after Miss Kalin left a hotel room where they had been drinking. Miss Kalin denied she had taken the money at her hearing. 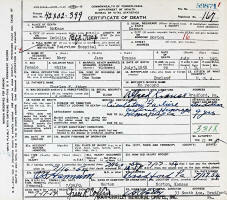 On March 11, 1942, Mrs. Alfred Krause was living in Pittsburgh, Allegheny Co., PA. 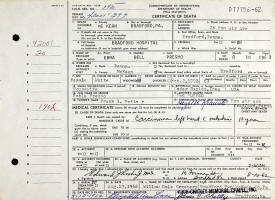 The WWII Draft Registration Report taken on April 27, 1942, shows O. 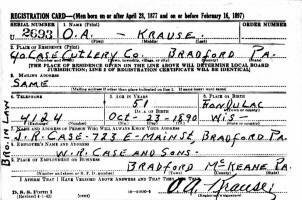 A. Krause (age 51) born October 23, 1890, in Fond du Lac, WI, is working for W. R. Case and Sons. 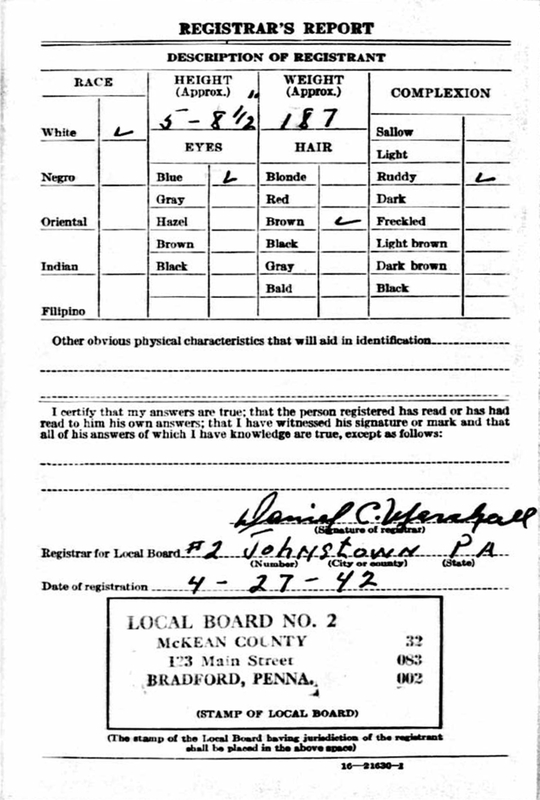 His contact person is his brother-in-law, J. R. Case, 723 E. Main St., Bradford, PA. His draft board is located in Collegeville, Montgomery Co., PA. 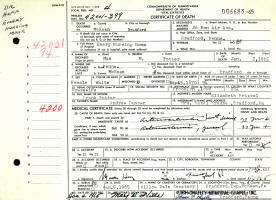 The WWII Draft Registration Report for Oren Alfred Krause. 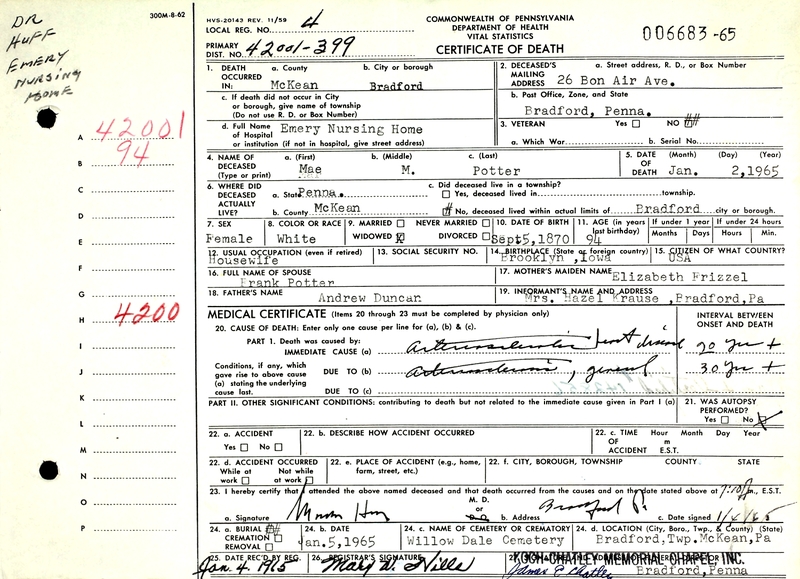 Following the death of Alfred's father, his mother Mary Jane (Abbey) Krause moved to the City of Bradford, McKean Co., PA, in October, 1943, and lived with him and Hazelle. They resided at 26 Bon Air Avenue. Alfred's sister, Effie Loretta Krause, married John Russell Case. Russ was the founder of the W. R. Case and Sons Cutlery Company in Bradford. On November 3, 1944, Mary Jane Krause fractured her hip, and remained a patient at Fairview Rest Home, Degolia, Bradford Twp., McKean Co., PA, until her death. Mary Jane (Abbey) Krause died July 17, 1954, in the hospital of Fairview Rest Home, Degolia, Bradford Twp., McKean Co., PA, at age 94. Buried in Spring Green Cemetery, Spring Green Twp., Furnas Co., NE. 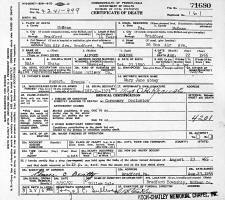 Mary Jane (Abbey) Krause Death Record. Mrs. Mary Jane Krause, 94, of Bradford, Pa., early resident of Norton County, died Saturday, July 17, at Bradford. Funeral services will be held at 2 o'clock Wednesday afternoon, July 21, from the Scott-Brantley Funeral Home. Rev. Rex Harmon will officiate. Interment will be made in the Spring Green Cemetery. Mrs. Krause was married to August Krause, who predeceased her Aug. 28, 1934. They lived for many years on a farm north of Norton near the Nebraska line. In the early 20's they retired from the farm and moved to a residence on west Main street, which Mrs. Krause owned at the time of her death. She was a member of the Christian church and lived her life by her churches teachings. She was considered a good neighbor and friend and leaves a number of friends in this community who will regret to learn of her death. Surviving are three sons and one daughter. They are Mrs. Walter Darling, Gooding, Ida., Alfred Krause, Bradford, Penn., Oscar Krause, Long Beach, Calif., and Wallace Krause of Iowa. The body of Mrs. Krause accompanied by Mr. Mrs. Alfred Krause will arrive in Norton by Rock Island train Tuesday morning. Case Cutlery Reaches All Fighting Fronts. Local Industry Heavily Engaged in Production Of War Goods; Firm Came to City in 1905. Fred J. Barnett and wife to O. A. Krause and wife, Bradford. Bradford Milk Co. vs. O. A. Krause. Trespass. Oren Alfred Krause died August 23, 1955, at his home in the City of Bradford, McKean Co., PA, at age 64. Buried in Willow Dale Cemetery, 30 Hedgehog Lane, Bradford, McKean Co., PA.
Oren Alfred Krause died August 23, 1955, at his home in the City of Bradford, McKean Co., PA at age 64. Buried in Willow Dale Cemetery, 30 Hedgehog Lane, Bradford, McKean Co., PA.
Oren Alfred Krause, 64, died unexpectedly at 5:15 p.m. yesterday at his home, 26 Bon Air Ave. He suffered a heart attack after returning from a downtown shopping trip. 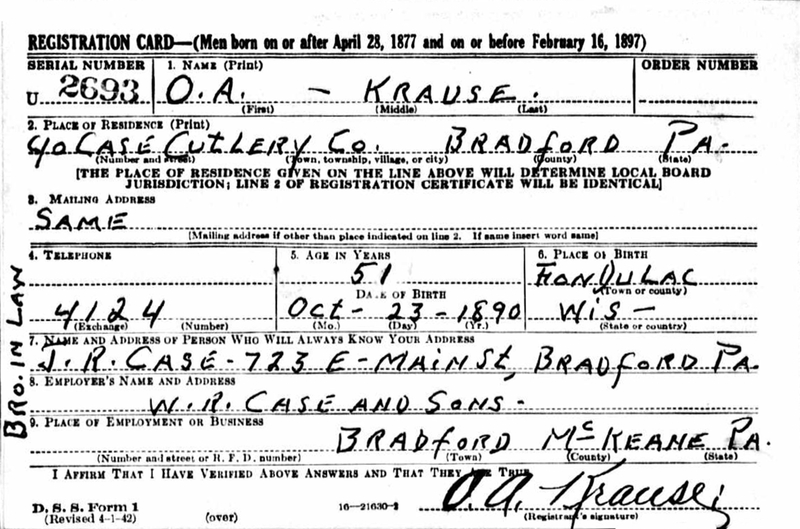 Mr. Krause was born Oct. 23, 1890, in Wisconsin and had served as a sales representative for W. R. Case & Sons Cutlery Co. for a number of years, the last 14 with headquarters in Bradford. Surviving are his wife, Mrs. Hazelle Potter Krause; two brothers, Oscar W., Bellflower, Calif., and Wallace E. Krause, Green Island, Iowa; a sister, Mrs. W. E. Darling, Gooding, Idaho, and several nieces and nephews. The body was taken to the Koch-Chatley Memorial Chapel. Funeral arrangements are incomplete. Funeral services will be held Thursday at 1:30 p.m. for Oren Alfred Krause of 26 Bel Air Ave., who died unexpectedly in his home Monday afternoon. John Stopfel, reader of the First Church of Christ Scientist, will officiate at the services in the Koch-Chatley Memorial Chapel. Burial will be in Willow Dale Cemetery. Mr. Krause was a member of North Star Lodge No. 23, Free and Accepted Masons of St. Cloud, Stearns Co., Minn., and the Minneapolis Consitory of Minneapolis, Minn. Bradford Lodge No./ 749, F. and A. M., will conduct services at 7:30 p.m. today in the chapel. Oren Alfred Krause Gravestone Card. Myrtle Louise "Mae" (Duncan) Potter died January 2, 1965, at Emery Nursing Home, Bradford, McKean Co., PA, at age 94. Buried in Willow Dale Cemetery, 30 Hedgehog Lane, Bradford, McKean Co., PA.
Myrtle Louise "Mae" (Duncan) Potter Death Record. Mrs. Mae M. Potter, 94, died Saturday night at the Emery Nursing Home where she had been a patient since 1961. She was born Sept. 5, 1870, at Brooklyn, Iowa, daughter of the late Mr. and Mrs. Andrew Duncan, and was married to Frank Potter who died in 1909. Mrs. Potter came here in 1954 to reside with her daughter, Mrs. Hazel Krause, 26 Bon Air Ave. She was a member of the Methodist Church of Minneapolis, Minn. Surviving are three children, Mrs. Krause, Mrs. Gladys Zelgart of Minneapolis and Ralph Potter of Buena Park, Calif., and nine grandchildren. Friends are being received at the Koch-Chatley Memorial Chapel where services will be held at 10:30 a.m. Tuesday with the Rev. Douglas P. Wright officiating. Burial will be in Willow Dale Cemetery. Erma Belle Potter died August 10, 1962, at Bradford Hospital, Bradford, McKean Co., PA, at age 63. 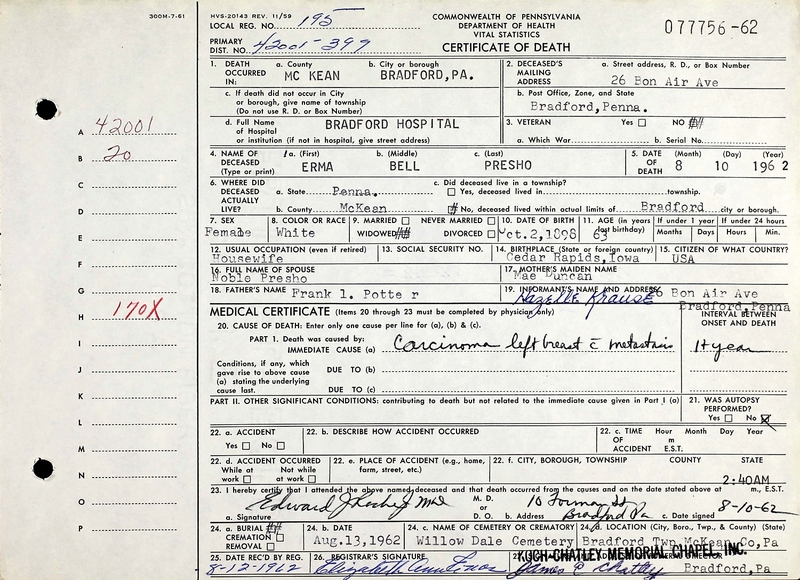 Buried in Willow Dale Cemetery, 30 Hedgehog Lane, Bradford, McKean Co., PA.
Erma Belle (Potter) Presho Death Record. Mrs. Erma Bell Presho, 63, of 26 Bon Air Ave., a resident of this community for the past five years, died at 3:40 a.m. Friday at the Bradford Hospital. She had been ill for the past two years and a patient at the hospital since March 15. Mrs. Presho was born Oct. 2, 1898, at Cedar Rapids, Iowa, daughter of Mr. and Mrs. Frank L. Potter. She lived at Montreal for a number of years, and following the death of her husband, Noble Presho, in 1957 and came to Bradford to make her home with her sister, Mrs. Hazel Krause. She was a member of the Church of England, Montreal. Also surviving is another sister, Mrs. Otto Zeighrt of Minneapolis, Minn.; a brother, Ralph Potter of Bellflower, Calif.; a son, Robert Presho, of Montreal; two grandchildren; her mother, Mrs. Mae Potter of Bradford, and several nieces and nephews. Friends will be received at the Koch-Chatley Memorial Chapel beginning at 3 p.m. today. Funeral services will be held at 10:30 a.m. Monday at the Chapel, with the Rev. Douglas Wright officiating. Burial will be in the Willow Dale Cemetery. Mrs. Erma Bell Presho, 63, Bradford, at Bradford Hospital. She had been in ill health for the past two years. Funeral services for Mrs. Erma Bell Presho, 63, of 26 Bon Air Ave., were held Monday morning at the Koch-Chatley Memorial Chapel. The Rev. Douglas Wright officiated. Pallbearers were Burrill Wanner, Jerry Smeigh, Donald Rathfon, William Maley, Glenn Williams, Albert Grove and Donald Graham. Burial was made in Willow Dale Cemetery. Hazelle Blanche (Potter) Krause died February 23, 1968, at Bradford Hospital, Bradford, McKean Co., PA, at age 74. Buried in Willow Dale Cemetery, 30 Hedgehog Lane, Bradford, McKean Co., PA.
Mrs. Hazelle Potter Krause, 73, of 26 Bon Air Ave., died Friday morning at Bradford Hospital where she had been a patient since Feb. 1. She was born March 30, 1894, at Cedar Rapids, Iowa, daughter of the late Mr. and Mrs. Frank Potter, and came to Bradford with her husband, Oren Alfred Krause, in 1941. He died Aug. 22, 1955. Surviving are a sister, Mrs. Otto Zelgart of Minneapolis, and several nieces and nephews. Friends will be received after 3 p.m. Sunday at the Koch-Chatley Memorial Chapel where a service will be conducted by the Rev. C. L. Sprague at 11 a.m. Burial will be in Willow Dale Cemetery.